After thirteen years of the tireless and selfless dedication of so many people, in holding and working towards fulfilling God's vision (first received in 1997), we are very excited to announce that the Louix Dor Dempriey Foundation has recently received its 501(c)(3) non-profit status as an educational corporation. This is a major step for any non-profit organization, and is instrumental in our ability to serve others and to make Louix and His teachings more available to the world. Having acquired our non-profit status also means that as of 19 March 2010, all donations and contributions to the Foundation are now tax deductible to the fullest extent of the law. We offer our deepest gratitude to everyone who has generously given their time, money, and love to this ministry. It is you who have made this possible. The Foundation is funded primarily by tithing, donations, and other philanthropic offerings to help us fulfill our mission of service to humanity. To make a love offering to the Foundation, please click here. In addition to receiving our non-profit status, we are also very excited about the myriad events the Foundation is now hosting in the Southwest and other parts of the U.S.A. Louix’s upcoming visit to Las Vegas this August will be His fifth series of events held there since July 2009. 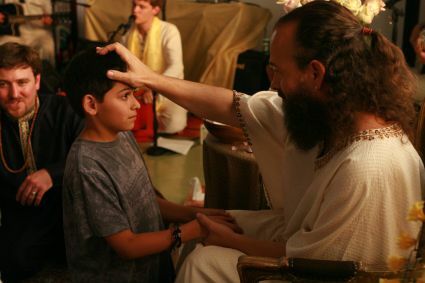 In 2010, the Foundation also began holding regular events in Los Angeles, the next one being on September 15th at the Rose Temple in Venice, CA, where Louix will be giving darshan (see our Upcoming Events schedule for more details). 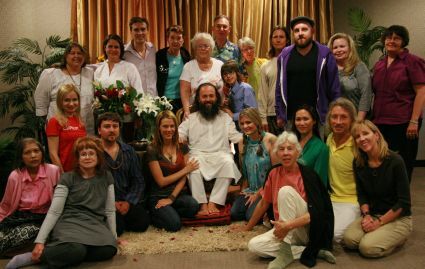 And, as always, we are increasingly having more events at our Mother Center, Prema Drala Ashram, in Laguna Hills (Orange County). In September, Guruji and a team of us from Prema Drala will be traveling to Racine, Wisconsin for one week of events and gatherings. Later in the fall, He will share His blessings with His beloveds in San Diego. This year’s events will culminate with the New Year’s Eve Retreat, which will take place at The Lodge at Torrey Pines, a 5-diamond resort in the beautiful coastal town of La Jolla (in Southern California). This is the first time in twelve years that Louix will be holding His traditional New Year’s Eve Retreat in the United States. In response to numerous requests over the years, the Foundation has now added an extra day to this event, making this five-day retreat a priceless opportunity to experience even greater levels of love and life-changing transformation in the presence of the Master. 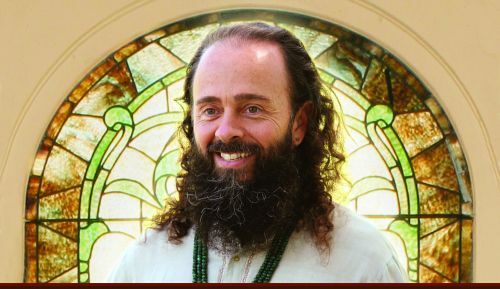 Those who know and understand some of the inner workings of spiritual Masters will be very excited to hear that this particular retreat will take place right after Louix’s return from a 5-week personal pilgrimage throughout India. Having meditated and performed sacred ceremonies at so many holy sites, and having received the darshan of numerous other Avatars and Masters He will be visiting, Louix will be arriving at this New Year’s Retreat in quite an exalted state—making this an event not to be missed! Click here for more information or to register for the retreat. August 21st (Saturday), 7:30 p.m.
A bliss-filled evening of devotional singing with Louix, as Pranam (our musical group) leads songs from many different cultures and traditions. September 15th (Wednesday), 7:00 p.m.
October 8th (Friday), 7:00 p.m.
For the first time in twelve years, Louix's traditional New Year's Eve Retreat will be held in the United States. Be transformed by His darshan and drink of His ageless wisdom over the course of five intimate and engaging days at this 5-diamond resort. August 25th (Wednesday), 6:00 p.m.
August 28th (Saturday), 7:30 p.m.
You can also go to http://www.meetup.com/AwarenessGroup/ for more information on Las Vegas events. September 23rd (Thursday), 7:30 p.m.
September 26th (Sunday), 10:00 a.m. - 6:00 p.m.
You can also go to http://www.meetup.com/Mind-Body-Spirit-Wisconsin/ for more information on Racine events. 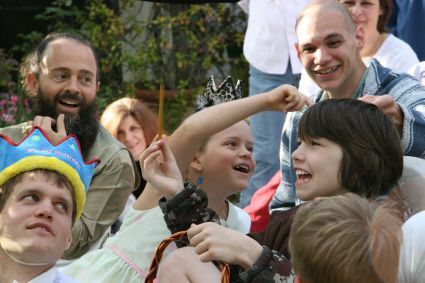 On April 4th (Easter Sunday) the family of Prema Drala Ashram, as well as disciples and devotees from abroad, gathered at the Sanctuary for Louix's annual ceremony and celebration of Spring, invoking the Nature spirits and God's blessing upon all our new endeavors for this year. This takes place in the Sanctuary garden each year during its first full bloom. Louix and His team spend weeks designing and planting many new annual and perennial flowers, the completion of which is always made to coincide with the peak bloom of all the perennial plants. 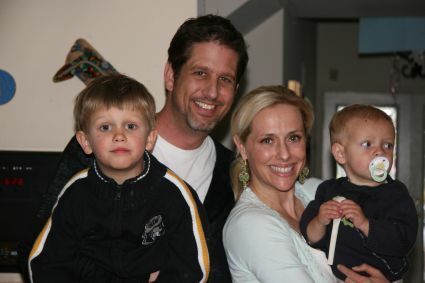 This year's celebration of Spring coincided with the April 3rd (shared) birthdays of Ariel Ganesha and Peter DeWitt. A delicious lunch with a variety of organic vegan dishes was prepared, and everyone enjoyed the beautiful weather and surroundings. The children giggled as they went on an Easter egg hunt. 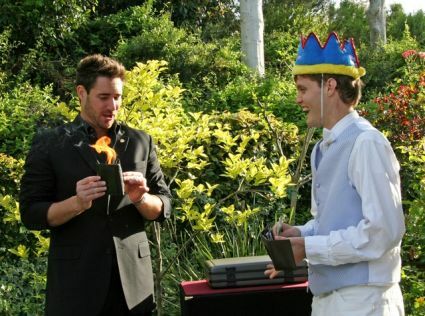 After the meal, children and adults alike were captivated and delighted by a humorous magic show. Mother Earth put on her own show this day, delivering a powerful 7.2 earthquake while we all sat in the gardens together, rocking and rolling for almost a minute (a very long quake) and watching waves spontaneously form in the in-ground spa and leap over its walls. (The epicenter of this quake was very close to the Mother Center.) After a strawberry shortcake birthday cake, the joy-filled day was brought to a close by watching Honey, I Shrunk the Kids. 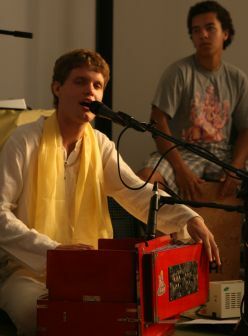 On April 10th, the ashram held an “Evening of Devotional Singing with Louix,” which was open to the public. 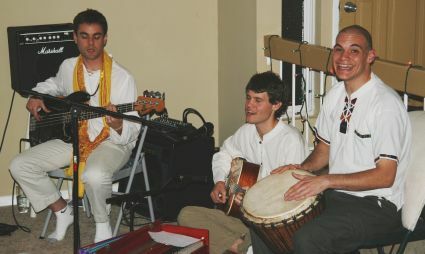 With Guruji leading the chants with Pranam (the Foundation's devotional music group), the vibration continued to rise throughout the evening, and newly-written chants were introduced, including “Om Mani Padme Hum,” by bassist Bill Russell. On May 8th, we held an "An Evening with Louix" at Prema Drala, wherein Guruji gave a riveting discourse on "Soul Initiation." Drawing on stories from His own spiritual training, He had the audience roaring with laughter as they absorbed His pearls of wisdom. He answered several questions, giving precious guidance to various members of the audience. The event went an hour longer than expected, yet all who attended wanted more! An audio product of this magical evening has been released under the title Soul Initiation. To purchase and download this 180-minute recording, click here. 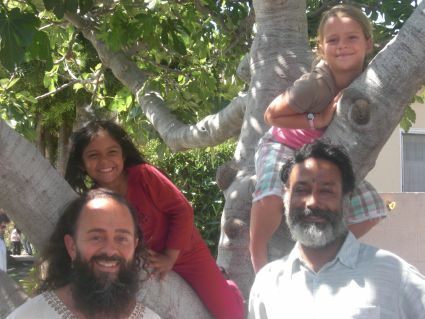 On June 12th, the Foundation held a public darshan at Prema Drala Ashram. 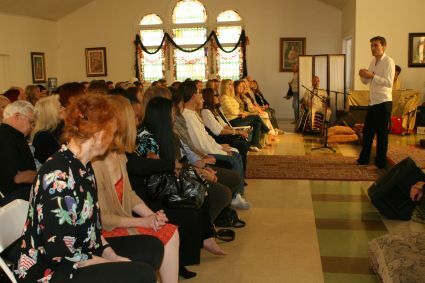 The 25742 La Serra home overflowed with disciples, devotees, and guests who came in anticipation of being in the Master's presence. 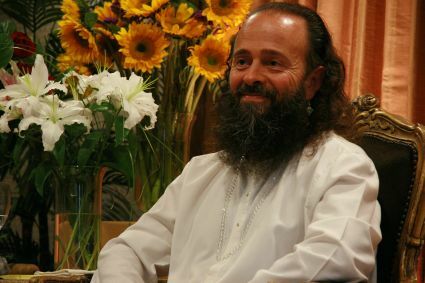 Guruji filled the room with His Divine Light, and offered a personal blessing to each person who came before Him. On June 19th, Louix met with Srila Narayan Maharaj, a 91-year-old spiritual Master from India who was visiting his main spiritual centers in the United States, including the Rose Temple in Venice, California. The meeting took place in a private home, and Guruji and four disciples were honored with a private audience. After this auspicious meeting, Louix, Ariel, and the other disciples had the pleasure of visiting Tapasyogi Kalathi Adiyen Nandhi (commonly known as Nandhi) at his temple in Inglewood, in southwest Los Angeles. Both of these beloved Masters and dear friends presented gifts to one another. Nandhi also led a puja in honor of Ariel, and bestowed her with a special mantra. On Father’s Day (June 20th), Louix and many Prema Drala disciples went on a camping trip at Blue Jay Flats, in the mountains above Lake Elsinore, California. Everyone enjoyed three days of bonding and spending time in nature on a fun-filled trip that included campfire sharings, lots of (Ariel's favorite) card game of "I Doubt It," and an hour-long hike to a beautiful waterfall, where they were enchanted by encounters with snakes, newts, beetles, tadpoles, and dragonfly nymphs. On the hike back to camp, Guruji (who at this point was leading), had the rare treat of having a fox run across the path directly in front of Him in broad daylight. From April 8 – 12th, Markus Kasunich and Zimmaron Zsido traveled to Las Vegas to hold Satsangs on behalf of the Louix Dor Dempriey Foundation and to promote Louix's upcoming visit. 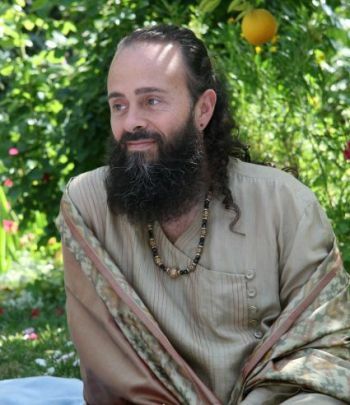 On April 9th, they held a Satsang in which Markus led a guided meditation. Afterwards, Markus and Zimmaron shared intimate stories about their profound walk with their Guru, including being on worldwide pilgrimages; showed unreleased film footage of Louix; and held an open Q&A session. They also held a Satsang on April 12th which included a ceremony with Pancho, The New Generation Crystal Skull, before returning to Prema Drala. Both these events were promoted by the Awareness & Consciousness Group of Southern Nevada. On May 19th, Louix gave darshan at the Wingate Hotel in Henderson, Nevada (just outside of Las Vegas). Guests continued to arrive throughout the evening, as 75 people received individual anointings of all different kinds from Louix. Pranam serenaded the room with devotional music as the bliss intensified and people experienced heightened states of love and joy. On May 22nd, Louix held a One-Day Retreat at the same venue. 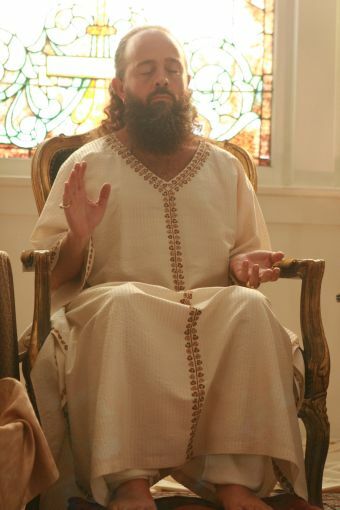 He began the retreat by leading a guided meditation wherein everyone summoned their closest guardian angel, and reconnected with that Divine Being. Following this meditation, Louix partnered everyone and asked that they stare into each other's eyes, and see and feel their angelic presence. After a mid-day break, he answered many questions from the participants, giving them specific guidance on how to deal with many life circumstances. Having absorbed His love and precious wisdom, everyone left with a more profound experience of God and Self. On April 17th, 2010, Louix gave darshan at the Rose Temple in Venice, California---His highly anticipated debut event in the Los Angeles area! About 150 people attended the event, which was a great success! Pranam played devotional music in the background, and the crowd joined in the singing, creating an exuberant atmosphere of joy and devotion. Date and Time: Last Wednesday of each month (July 28th, August 25th, September 29th, October 27th, November 17th, December 22nd), at 7:30 p.m. 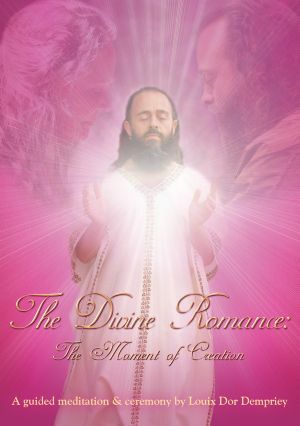 Enter the courtship with The Beloved of your soul through this meditation and sacred ceremony, in which you will experience God adoring humanity at the very moment of our creation. Feel the full restoral of yourself as Love, as you reconsecrate and recommit your life to the Divine. The ceremony includes a live version of the devotional song "Hosannah" by Pranam. This product is now available and can be purchased through our online store at www.prasadthestore.org. We have released a new product entitled Soul Initiation, recorded from our most recent "Evening with Louix" on 8 May 2010 at Prema Drala Ashram! Drawing from stories of His own spiritual training, He had the audience roaring with laughter as they absorbed His pearls of wisdom. 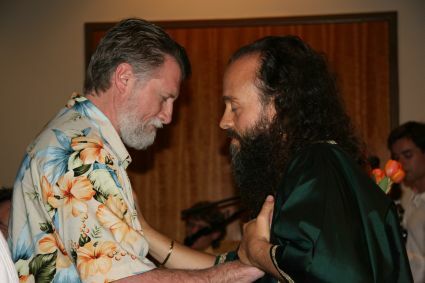 He answered several questions, giving precious guidance to various members of the audience, and offered many sacred tools and techniques to assist ones on their own paths to self-mastery. The event went an hour longer than expected, yet all who attended wanted more! To purchase this 180-minute digital download, click on this link: Soul Initiation.